Cleckheaton captain John Wood hit a century against Batley. Cleckheaton held their nerve to record a one-run win over Batley and register their first win in the Bradford Premier League last Saturday. Cleckheaton were guided to a decent total of 234-8 by a splendid century from captain John Wood. He made 122 in an innings which included fours sixes and 13 fours and he was supported by overseas player Qaisar Ashraf, who made 43. Mohammad Shanawaz was pick of the Batley bowlers as he claimed 4-56. Batley had lost their opening three matches but came close to recording a first top flight win. 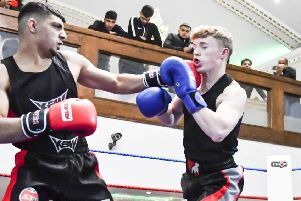 Opener Sufyan Patel (48) and Shabir Rashid (37) set the tone, before Muhammad Khan threatened to guide his side to victory. Khan made 74 but in a tense finale, he was run out off the fifth ball of the final over as his side were all out for 233. Left-arm spinner Nick Lindley took 4-55 for Cleckheaton. Townville, promoted with Batley last season, earned a third straight win as they defeated Pudsey Congs by eight wickets. Congs were dismissed for 162 as Peter Hepworth (4-27) and Connor Harvey (3-34) impressed despite the efforts of Congs batsmen Irfan Amjad (51) and Danish Hussain (40). Townville opener Jonathan Booth made an unbeaten 65 and shared an unbroken third-wicket stand of 97 with Jack Hughes (66no), who struck struck 10 fours and two sixes to steer the home side to victory.